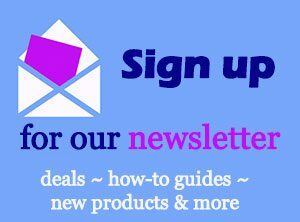 The ease with which you can sign up for a new email account means that you do not have to put up with a different email provider if you are not happy. 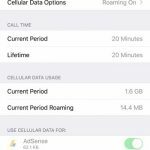 So if you have switched from AOL email to another provider, such as Gmail, Yahoo or Outlook.com, then you might be ready to remove your AOL email account from your iPhone. 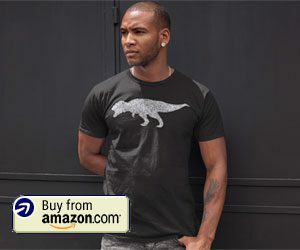 This is a process that can be accomplished through just a few short steps, and it can be done entirely from the iPhone. 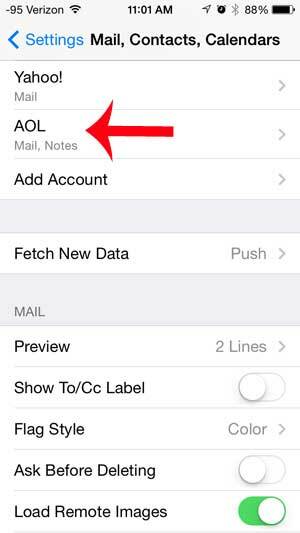 So once you have followed our steps below, you will not need to worry about continuing to receive any messages from your AOL email account on your iPhone. This tutorial was performed in iOS 7 on an iPhone 5. The steps are nearly identical for earlier versions of iOS, but the screen images will look different from your phone if you are using iOS 6. Note that this is not cancelling your AOL email account. 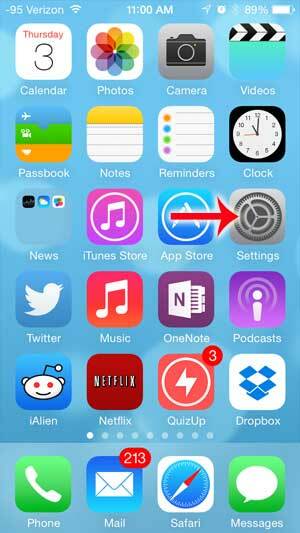 This is simply removing the account and its emails from your iPhone. You will still be able to access your AOL email from a Web browser (like Internet Explorer, Firefox or Chrome) and you will still be able to access it from other devices. If you wish to deactivate your AOL mail account, scroll to the bottom of this article to see how. 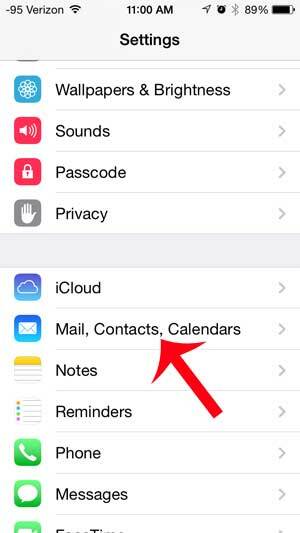 Step 2: Scroll down and select the Mail, Contacts, Calendars option. In iOS 10, you will be selecting an option that just says Mail. Step 3: Select your AOL account from the Accounts section of the screen. In iOS 10, there is an Accounts option that you must select first before you see the full list of email accounts. 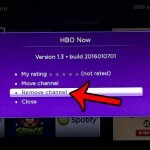 Step 4: Touch the Delete Account button at the bottom of the screen. 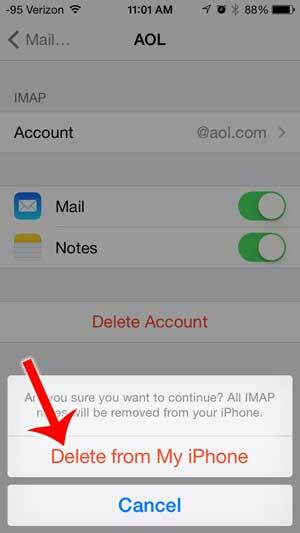 Step 5: Touch the Delete from My iPhone button to confirm that you want to delete your AOL email account from your iPhone. 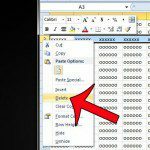 Note that this method does not delete or deactivate your AOL email account. It only removes it from your iPhone. 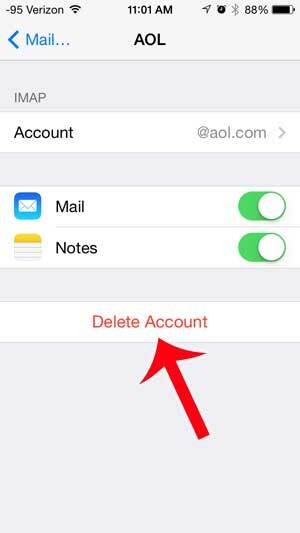 If you wish to delete your AOL email account entirely, then follow the steps below. Go to https://myaccount.aol.com, and sign into your AOL account. Click Manage My Subscriptions at the top of the window. Click the Cancel option under your account. Select the reason you are cancelling, then click the Cancel AOL button. 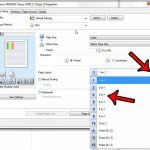 If you are deleting your AOL account because you have upgraded to Gmail, then you can read this article to learn how to set up Gmail on your iPhone.